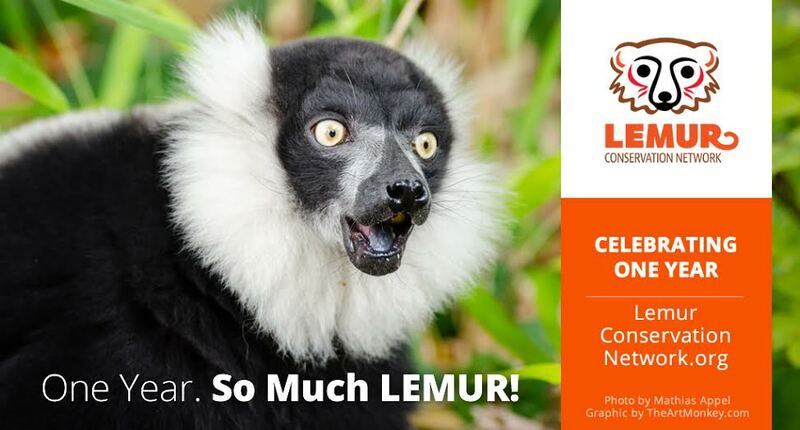 This February 25th, the Lemur Conservation Network will celebrate its first anniversary. As Director of the Lemur Conservation Network, I wanted to take this opportunity to thank everyone who made this endeavor possible, look back on all we accomplished in our first year, and look forward to exciting things to come in years future. On February 25th 2015, the Lemur Conservation Network (LCN) was launched globally. The launch coincided with the one year anniversary of the IUCN Primate Specialist Group’s Lemur Action Plan, published in the journal Science. The plan targeted 30 priority sites across Madagascar with urgent conservation strategies aimed to save lemurs from extinction, and said it would take about $7 million to fund the initiatives, but it had yet to be fully funded. That’s where the Lemur Conservation Network came in. 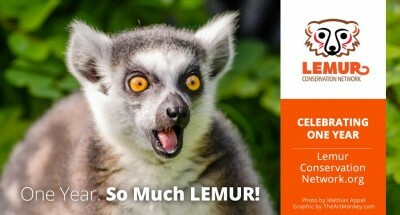 LCN formed to raise awareness about the importance of lemur conservation, and to encourage everyone to help. The network unites over 40 organizations working on the ground in Madagascar to protect the land and its unique species, plus zoos and research groups also doing their part. We aim to educate the public about Madagascar’s unique biodiversity, and urge all friends of lemurs, conservation, and the earth to support the cause and the projects in the action plan. The network was co-created by Lynne Venart, a web designer in Washington DC, and Kim Reuter, a member of the IUCN Primate Specialist Group who now works for Conservation International. One of the biggest motivations for creating the network stemmed from the issue that donating to small programs in one of the world’s poorest countries was not exactly user friendly. Donating to individual projects or organizations requires more investigation than people expect nowadays. So the website for LCN was developed to be an online fundraising guide to make it easy for everyday people, as well as zoos or philanthropic organizations, to take that step to donate to lemur conservation. By bringing in all types and sizes of organizations, it (LCN) lets people decide what organization most interests them. Many of the organizations in the Lemur Conservation Network do not have the budgets or the technological know how to actively promote their work online, but that doesn’t mean their conservation work is any less worthy of support. Since our launch last February, we have added educational resources focusing on lemurs, rainforest conservation, and biodiversity to the website, launched a Malagasy-language version of the site, and continued to expand our membership. As of today, our membership includes 40 conservation organizations, 13 research groups, and 9 zoos. Our members come from Madagascar, the United States, the United Kingdom, Canada, Germany, Switzerland, and Italy. I am proud of the diversity of the member organizations in our network, and inspired every day by the phenomenal work they do to save lemurs from extinction, as well as help the people and the environment of Madagascar. But none of what we do would be possible without you, our fans, followers, and blog readers. I am proud to say that the Lemur Conservation Network has over 4,000 followers on Facebook and Twitter, representing over 45 countries! Our Facebook posts reach an average of 30,000 people a week thanks to all of you who share our posts. That is a lot of people around the world being engaged in lemur conservation thanks to the Lemur Conservation Network! Most importantly, I know that many of you have donated to some of our amazing member organizations, which is why we exist in the first place. From the bottom of my heart, thank you for supporting lemur conservation. These amazing and endangered primates need your help more than ever! Even though I run the day-to-day operations of LCN, I could not do it without the help and support of some great collaborators, so I want to take this opportunity to thank them as well. Co-founders Lynne Venart and Kim Reuter continue to contribute to the network via blog posts, graphics, and advise on many decisions. The groundwork they laid one year ago is something I try to live up to and keep alive everyday. Fabiola Holiniaina Kjeldgaard is our Community Outreach Coordinator, and she is an expert at building content about lemurs and conservation for the Malagasy community, as well as running the Malagasy version of the site. Our project advisors contribute decades of experience and expertise the operation of the network. They include Russell Mittermeier, Chair of the IUCN Primate Specialist Group and Executive Vice President of Conservation International, Christoph Schwitzer, Director of Conservation at Bristol Zoological Society, Steig Johnson, biological anthropologist at University of Calgary, and Jonah Ratsimbazafy, Secretaty General of the Malagasy primate research group, GERP. 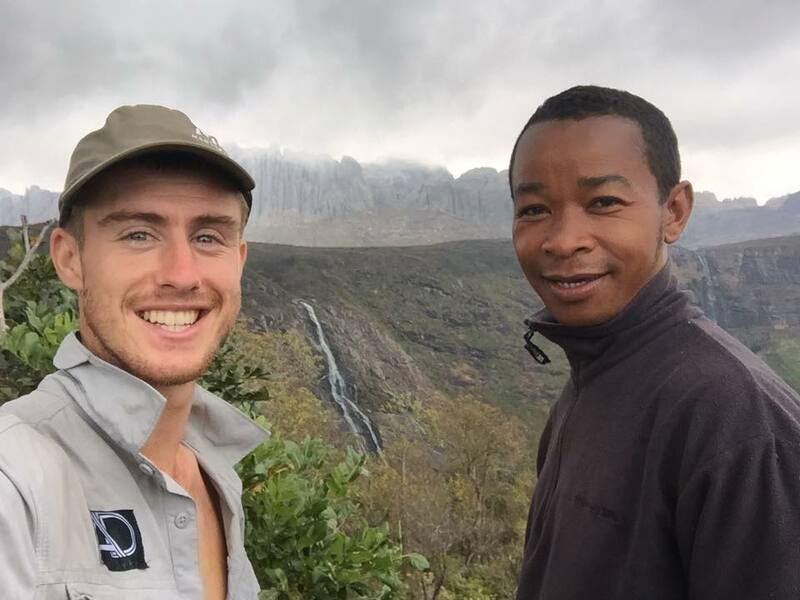 Ash-Dykes and one of his guides on his trek across Madagascar. We accomplished a lot in our first year of existence, and I feel we became a major player in the world of lemur conservation. In September 2015, 2015 Adventurer of the Year Ash Dykes embarked on a world’s first: to traverse the entire length of Madagascar on foot. That is 1,800 miles—across high mountains, grueling desert, rainforest, barren landscapes, and dense vegetation. He completed the amazing, record-breaking journey just this month. While on his trek, Ash worked with the Lemur Conservation Network to raise awareness for conservation of Madagascar’s unique biodiversity, and meet with lemur experts. The story was picked up by media outlets around the globe, including Forbes, BBC, Mongabay, TakePart, and The Guardian, bringing worldwide attention to LCN and the work of many of our member organizations. 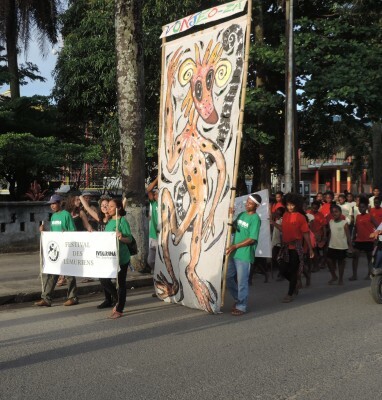 In October 2015, the second annual World Lemur Festival was celebrated around the world, and the Lemur Conservation Network played a big role in promoting the many events held throughout the globe. 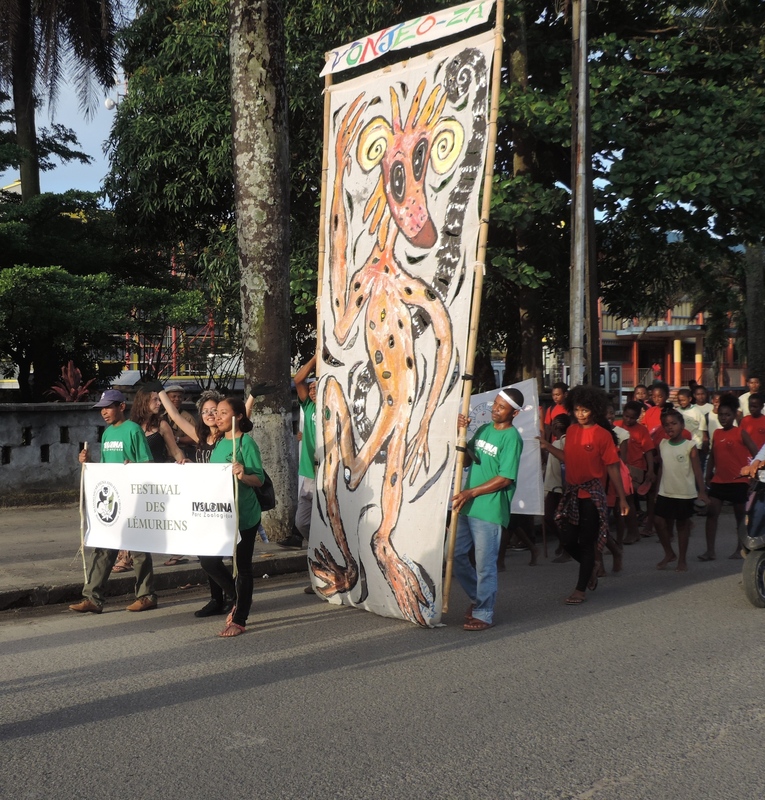 The event’s aim was to raise awareness for lemur conservation, celebrate lemurs and Madagascar, and educate the public about why it’s important to protect them and their habitats in Madagascar. By all accounts, not only did this year’s events go above and beyond in fulfilling this mission, but the festival was even more successful and featured even more events than the first festival a year ago. All told. there were over 25 different in events held in over 10 countries. This February, I was invited to speak on behalf of LCN about biodiversity conservation in Madagascar at the National Biodiversity Teach-in, a series of webinars hosted by wildlife and conservation experts around the world for high school and college students. Thousands of students tuned in to learn about lemur conservation, and most importantly, how they can help support lemur conservation. LCN will also be represented at the International Primate Society Conference in Chicago, IL, USA this summer with a poster and happy hour get-together. For all that we’ve accomplished in our first year, I am even more excited about what I hope we will accomplish in the years to come. Look for new member conservation organizations, research groups, and zoos to continue to be added to the network. We are hoping to help make the third annual World Lemur Festival in 2016 even bigger and better than the year before, and certainly more organized. There is no reason why it can’t be as organized and well-known an event as World Elephant Day, World Rhino Day, or International Cheetah Day. We will also have very exciting news to share in the coming months about how the Lemur Conservation Network will be promoting the new primate-watching and primate life-listing movement, including a brand new smartphone app. So spread the word to your family and friends! Let’s continue to grow together, and bring the most attention we can to lemur conservation. Together we can make a difference.